The third of my Time of Legends novels was the biggest of them all. 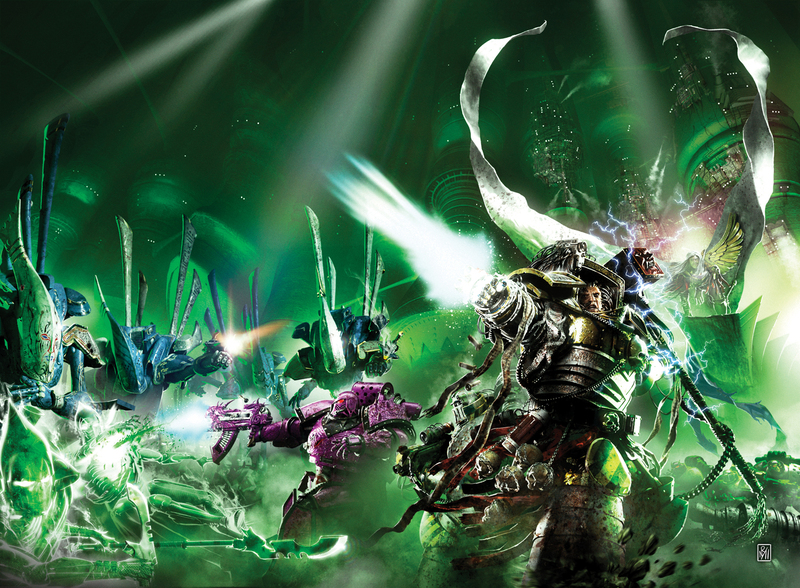 It recounts the battle between the forces of life and death, the clash of Sigmar and the Great Necromancer himself, Nagash. Mike Lee had already done a fantastic job of telling the story of Nagash – the Early years, and I took what he’d done and blended it into the mix of what I wanted to do in this book. By now, the Sigmar books had become a thing unto themselves, with a large cast of characters and a wide-ranging geography and mythology. Going into the book, I’d imagined that this was going to be the last book, the one where I finally got to put the capstone on the life of the Empire’s greatest hero, but the more I wrote of it and the more Nick Kyme kept badgering me to put in threads to pull at a later date, the more I realised how much more of Sigmar’s story I still wanted to tell. God King was to be the Old Man of the trilogy, the book where the characters have grown up, matured, had children and are now facing – in a very literal and metaphorical way – death in the face. Heldenhammer was a brash book, full of youth and cockiness, Empire a more sedate, mature novel, God King would be the hoary old veteran. These were characters who’d weathered the worst the Old World could throw at them – continent spanning orc invasions, the fist incursions of Chaos – but now they’d have to face the master of Death himself. They might be older, but there were none so old as Nagash. The peril in the first couple of books was for the characters themselves, with each person (with the exception of Sigmar) mainly afraid for their own lives. But in God King that’s not the case, each of the main players has other lives to consider; wives, children and loved ones. Death is not just something you fear for yourself, but those around you. A warrior can face down fear with courage and a sharp sword, but when the wolves are hunting your children and there’s nothing you can do to help them…that’s when courage is really tested. I already had a son by this time, with a daughter on the way, so the notion of family was uppermost in my mind in writing this book. To me, that was the glue holding the Empire together, the bonds between family and fighting for those who couldn’t fight against all the myriad threats that assail hearth and home. It gave this book a real personal flavour, and the scenes where the children of the characters are threatened had a real emotional impact on me while I was writing them. One thing I found when writing God King was that the mightier Sigmar became, the harder it got to actually have him front and centre in the narrative. By the time of Nagash’s rise, Sigmar’s been Emperor for quite some time; he has armies to fight his wars, and doesn’t need to ride off to complete a quest when there are entire cadres of knights and warriors to do it for him. That was another reason to keep things so personal, to get Sigmar out and about, smiting things with his hammer and being the agent of change in his own story. As the ‘final’ book in the trilogy, a lot of things had to be ended, and it was time to say goodbye to a number of my favourite characters. Eoforth met his end at the terror of a revenant. Alfgeir was, if not dead, at least beyond the reach of mortal concerns. Redwane was mad and lost to the cult of the flagellants. Pendrag had died upon Middenheim’s rock at the hands of Gerreon/Azazael. Only Wolfgart remained, but if Sigmar’s going to have one friend stand by him, there’s none better. Speaking of Gerreon, his story is one I want to pursue. If you know your Warhammer lore, you’ll know who the young boy he meets at the beginning of the book grows up to be. I think there’s a novel in their relationship and time in the north. And if there isn’t a story worth telling in their return to the Empire, I’ll eat my hat. If I had one.